Turn two stove burners on medium high. Place poblanos directly on burners. Roast until all sides of the poblano are charred, about 2-3 minutes per side. Remove. Let sit to cool down. Using a knife gently remove the charred skin off the poblano, then dice the poblanos. Set aside. Preheat a large skillet to medium high heat. Add in bacon, cook for 5-7 minutes until slightly crispy. Remove the bacon from pan and place on a paper towel lined plate to drain the grease. Empty the bacon grease from the pan and place pan back on the burner. Immediately add red onions to pan and saute for 2-3 minutes until onions are translucent. 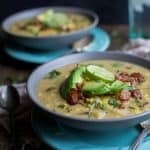 To a large crock pot, add corn, yukon potatoes, bacon, red onions, poblanos, ground cumin, smoked paprika, salt, garlic cloves, vegetable stock, and water. Place cover on and cook on HIGH for 4 hours. Using a ladle, add 2 cups of the soup from the crock pot to a blender or food processor. Then add coconut milk to the blender. Turn on high and blend until mixture is smooth and coconut milk is incorporated. Add blended coconut milk mixture back to the crock pot along with fresh cilantro and lime juice. Stir and cook for 10 minutes. Serve! Top with avocado and cilantro.